To be honest, you can’t really say which controller is better, as you can easily get used to either one. For example, I had a PlayStation for about 10 years before I got an Xbox, and, within about 2 weeks, I was easily able to pick up the Xbox controller and use it and vice versa. After using the Xbox for 2 years, I went and got a PS3 and I was easily able to switch between the two. 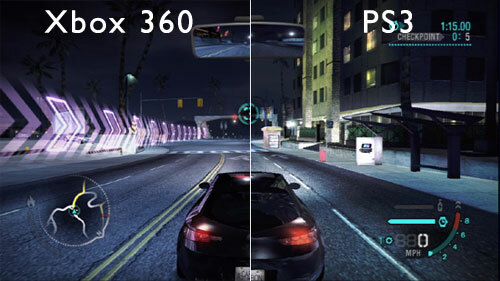 Without boring you with all the techy stuff (sorry), the Xbox and the PS3 have virtually the same graphics card. The processor on the PS3 is better, but it is extremely hard to make a good game for it (from what I’ve heard) while the Xbox has a slightly worse processor, but it is much easier to program for (again, from what I’ve heard). That would explain the higher game count on Xbox. Let’s start on a bad point for both consoles. Xbox has this stupidly annoying feature called region lock, which is literally what it says. You can’t play some games hosted in other countries. I have come across countless hackers on the PS3 as in, one in every 20 games will be hacked or modded in some way. Now this thing with the PS3 might just be me getting unlucky, but I truly doubt it. Now on to the good stuff. PSN/SEN is FREE! I love it. I can make countless accounts, go and use the first gun and go and pwn some of what I consider the ‘easier’ opponents or ‘n00bz’. On the Xbox, however, you have to pay, but it is a measly £39.99 per year. For actual connectivity I would say that it is the PS3, but for security I would say that without a doubt the Xbox. I’m going to make this clear. By online features I actually mean chat and the online store ie. the Xbox Marketplace and the PlayStation Store. Regarding chat, Xbox is definitely the winner. With cross game and single player chat it is superior. When you do get to finally talk to people on PS3, I don’t think it is of as good a quality. That is my own opinion, but don’t say anything unless you have actually experienced both consoles. Now onto the Xbox Marketplace and the PlayStation Store. I find that downloading from Xbox is significantly quicker than PS3. However, trying to find things on the Xbox is a nightmare. Do you want the DLC? No. The demo? No. How about the trailer? NO! Then you will – eventually – find the game. On the PS3, I think that the Store has a significantly better layout, but poorer download speeds. I know this may sound like a stupid category, but I think it is important. I am not going to give this one a rating however, because the two consoles were designed for a different audience. The Xbox, with its tougher design, means that it is more suited to a family environment. The PS3, with its sleek design, is more designed for the careful gamer. Sounds stupid, but it’s true. I have dropped both my Xbox and PS3 (like a boss) and the Xbox definitely fared better. Anyways, enough of this stupid topic on to the next. I’m going to do this in a HDD capacity to Amazon cost ratio. I will take the highest capacity of each that is currently available, and not include the prices of motion controllers ie. Move and Kinect. As you can see, the PS3 is marginally more expensive per gigabyte, which is probably due to the Blu-ray, but what can you do about it? The PS3 is definitely the bigger model and this is because of the massive power brick that sits outside the Xbox is actually inside the PS3 which essentially makes it sort of portable. Microsoft decided that the Xbox’s power brick outside. This makes the model smaller than its counterpart. All of this said, you may be surprised to hear that the PS3 uses 30W less energy than the Xbox. Simply put, the Xbox has sold 65.8 million units and the PS3 has sold 62 million. This may be down to games, or availability. Many people say that the Xbox has the red ring of death, but what they don’t know is that the PS3 has the yellow light of death, which means exactly the same thing on both consoles. They’re screwed. It does have to be said, however, that the PS3 has significantly less reported incidents of the YLOD than the Xbox’s RROD. To conclude, I will count up the points of each console and total them below. Please note: I did not go back and change any of the results, I left them how I thought they should be.